1 For Curtido, combine Hellmann's® or Best Foods® Real Mayonnaise, 1/3 cup cider vinegar, salt, sugar and red pepper flakes in large bowl. Add cabbage and carrots. Finely slice 1/2 of the white onion and stir into cabbage and carrots; refrigerate until ready to use. 2 For Salsa, process remaining 1/2 of the white onion, roughly chopped, plum tomatoes, garlic, chilis, 1/2 cup water and 1/2 tsp. Knorr® Chicken flavor Bouillon and remaining 1 tsp. of vinegar in blender until smooth. 3 Heat 1 Tbsp. oil in medium skillet over medium high heat. Carefully pour contents of blender into skillet and bring to a boil. Cook until reduced by half, about 10 minutes. Cool to room temperature before serving. 4 For refried beans, heat 1 tsp. oil in medium skillet and cook yellow onion, stirring occasionally, until golden, about 5 minutes. Transfer to blender, reserve skillet. 5 Add beans, 1/2 cup water and 1/2 tsp. Bouillon to blender or food processor and process until smooth. Heat 2 Tbsp. oil in reserved skillet and fry bean mixture, stirring, until very thick and darkened slightly; reserve. 6 For cheese filling, process cheese and poblano pepper in food processor until paste-like consistency; reserve. 7 For pupusas, combine masa, remaining 1/2 tsp. Bouillon and 3-1/2 cups water in large bowl to form a slightly sticky dough, adding more water, little at a time, if needed. Cover and let rest 10 minutes before forming pupusas. 8 Divide dough into 20 egg-size balls, cover with a damp towel. Form each ball into a deep bowl shape, fill with 1 scant Tbsp. cheese mixture, pressing into side of dough, then top with 1/2 Tbsp. bean mixture. Bring edges together to seal. Gently pat and squeeze ball to form a flat disk, about 4-in. ; repeat. 9 Heat skillet over medium high heat. Lightly brush with 1 to 2 tsp. oil. 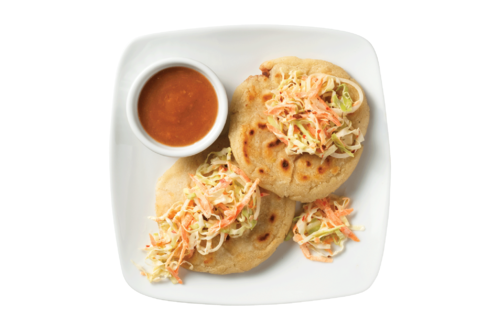 Cook pupusas in batches, until golden, with slightly darker spots, about 6 minutes, turning once. Serve with Curtido and Salsa.